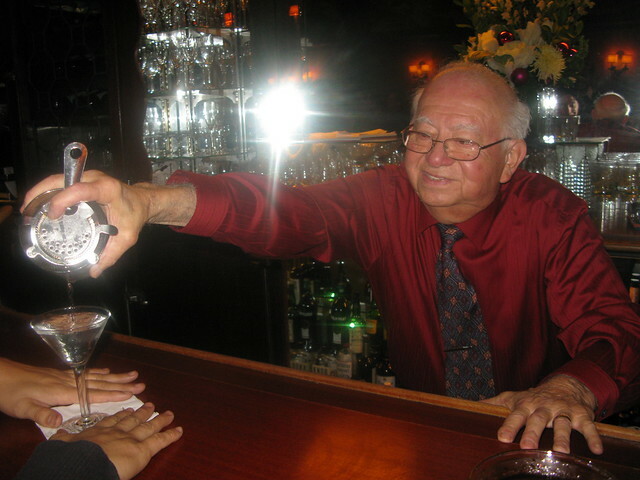 Musso & Frank’s Manny serving up a Gibson. 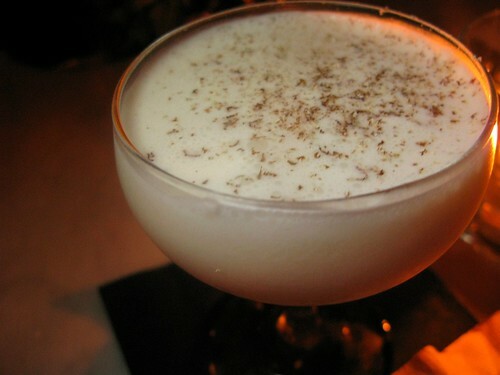 Here they are, my top 10 cocktail faves from 2010, listed in alphabetical order. 1) The Drink That Shall Not Be Named from Providence: I was researching holiday cocktails when Zahra Bates of Providence hinted that she was working on this bruleed persimmons concoction. Naturally, I had to check it out so swung by the restaurant. Zahra was still tweaking the recipe but I was impressed by her thinking outside of the box with this one. The cocktail was originally supposed to be a champagne drink involving bruleed grapefruit but it evolved into this one with a mysterious, Harry Potter-esque name. Made with Leblon Cachaca, grapefruit juice, hachiya persimmon, Averna Amaro and cinnamon sugar, it’s a beautiful cool drink that possesses such warmth. It’s not on the cocktail menu but Zahra said she’ll gladly make it for anyone who asks for it. 2) Earl Grey Martinez from 320 Main: I had been dying to hit up 320 Main in Seal Beach ever since I first heard about its “Clubbed Baby Seal” cocktail which has since been renamed “George” as in Of Mice and Men. Plus I was assured that they love baby seals for hugging, not clubbing. Only problem with this place is that it’s in Seal Beach. Such a shame, at least to me, because otherwise I could see myself being a regular here. The staff is so friendly, the cocktails innovative tasty turns on classics and how could I not love owner/bartender Jason Schiffer? But his Martinez made with Beefeater Gin infused with Earl Grey Tea, Sweet Vermouth, Bitters and Maraschino Liqueur is simply gorgeous. 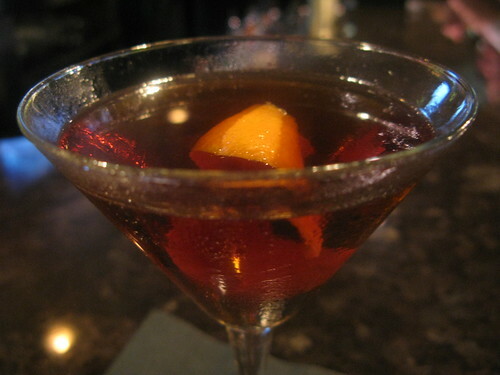 With the flavor and complexity of a Manhattan. 3) Gen Eva from Eva Restaurant: Bartender Tricia Alley, who I first met at Providence where I enjoyed her Opium Den cocktail, took over the bar program at Eva back in August but I visited her there for the first time just last week. And even though I still love the Opium Den, which she brought over from Providence, where she still works, I couldn’t resist her Gen Eva, a flavorful mix of my favorite Bols Genever, clove Riesling reduction and lemon. 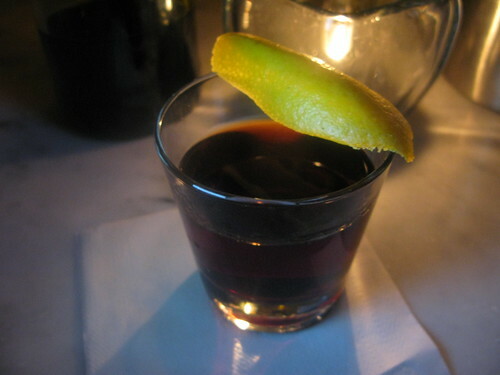 She also does a warm version which should definitely replace mulled wine on your holiday drink list. 6) Golden Goose from Drago Centro: Not only was this a beautiful-looking cocktail with its tuft of a gooseberry garnish but its mix of Bulleit Bourbon, Fernet Branca, Fresh Cape Gooseberries and maple syrup was my instant favorite off Drago Centro’s fall menu. I couldn’t help but knock this one back and out of the 11 cocktails we sampled that night, this one the only one I almost finished. Cheers to Beverage Director Michael Shearin and head bartender Jaymee Mandeville for coming up with this beauty. 7) Mad Man from Hollywood Roosevelt’s Library Bar: Two classic cocktails in one glass. Library Bar’s Matt Biancaniello never fails to wow me but when he created this cocktail which is comprised of a Sazerac and an Old Fashioned in a Jager glass (separated by a brandied cherry) my head exploded. So simple and yet ingenious, plus, even though it’s $15, you feel like you get your money’s worth with this tasty 2-fer. 8) Staten Island from 1886: OK, Bols Genever is one of my favorite spirits. Gosh it’s so nommy! So it shouldn’t be a surprise that I count this drink as one of my top picks for 2010. The Raymond’s new bar, created by cocktail history buff Marcos Tello and Aidan Demarest, boasts an extensive list of drinks comprised of old and new classics. This one made with Bols, Galliano and Amaro Ramazzoti is a nod to Staten Island which was originally a Dutch colony but now has a large Italian community. 9) Tapping the Admiral Redux from La Descarga: The new and improved Admiral is ?now barrel aged for two weeks in whiskey barrels and served neat, exponentially better,? according to LD’s owner, Steve Livigni. And he wasn’t kidding. The cocktail is made in a style called Scaffa which was popular from the 1860s til the ’20s and it’s neither shaken nor stirred but rather simply built. It’s also meant to be sipped and savored and is best enjoyed with a nice cigar in LD’s back room. 10) White Manhattan from Vu Restaurant: Bartender Jolie Klein of Vu opened up my eyes to white whiskey via her White Manhattan. It’s made with Luxardo maraschino liqueur, bitter’s truth decanter and Death’s Door and possesses all the tastiness of a Manhattan with none of the color. Fortunately it actually tastes good, and won’t suffer the same fate as Crystal Pepsi. It’s no Whistlepig Manhattan (see Hemingway’s post) but I wouldn’t kick it out of bed. By the way, if you love pictures of cocktails, I made a whole calendar of them, CoC Cocktail Hour Calendar, so you can stare at yummy drinks all year. that little old man in the top picture is so cute!! He’s so adorable. I want to put him in my pocket and take him with me. So glad to have enjoyed a few of those with you! 🙂 BTW during regular service, Manny leaves a little carafe with your martini, so it’s more like 1.5 glasses. He’s the best! Aw, man, he’s already married, right? Great article. I feel accomplished that I have been to some of these places… Okay, only two. BUT STILL! And, I, for one, am glad that you’re farther from 320 Main… that way you cannot steal my seat at the bar. 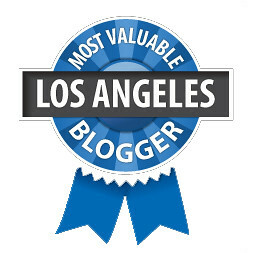 Are you a publicist for Red Medicine?